Hey everyone! I'm excited to share my progress here towards my goals of becoming ever healthier. I started out in 2014 weighing 425lbs and now find myself down to 175. Looking forward to the ever continuing journey. I'm also excited to share my experiences and knowledge I used to get to where I am today. Head over to http://diet.tiverty.com to see some of the tools and tips I gathered over the years for weight loss. To start out with; WOW! This whole process has just been a flurry of adjectives. Exciting, worrying, humbling, tiring, painful, surprising, itchy. Just to name a few. Week two was not what I expected, being rougher in my opinion to go through than the first week. In the first week I had the worst pain (though when it was bad it always seemed to be relatively brief), and I was more or less immobile and dependant on others. My mobility, independence, and being able to stand up straighter has drastically improved in week two, however it's also brought some of the roughest parts of my recovery so far. The first week of going through a slap chop. Things start pretty fast if you are scheduled for a morning run. You get to the hospital and into the surgical pre-op staging room. Here you get to meet all the wonderful people like your nurses, assistant anesthesiologist, anesthesiologist, surgeon and more. Each of which you will end up forgetting. They ended up putting the IV in my foot, which I hear is rare, as they would be flipping me around like a short order cook making pancakes through the procedure. One of the final things that happened is my surgeon came along with his purple crayons and did some impressionistic art on me. Anyways, shortly after this I was wheeled away and honestly taken to what I assume was the surgical theater, after this photo was taken, I don't remember a thing that happened to me. 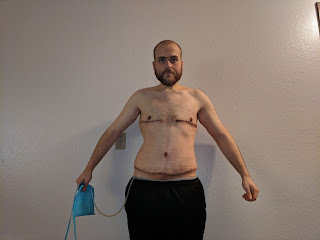 As many of you reading this may know, I am going in this Friday (1/12/18) to have skin removal surgery done after my weight loss of 250lbs. They will be reducing the extra skin on my arms, chest, abdomen, and then the beltline (which pulls some of the buttock). It's not an easy surgery to go through and recover from. Recovery itself seems to lay you out from normal life activity for a week to two, and you are not back to pre-procedure levels for six or more weeks. 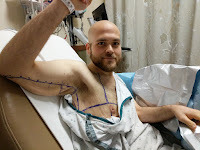 The scars themselves are pretty gnarly (though much less visible than your extra skin), and the cost is often prohibitive for most (or at the very least puts you into medical debt for a few years as insurance will often cover just a portion or none of the surgery). So the question really comes to mind as I count down the days and then hours to this surgery. Count your blessings, and your calories! One of the largest reasons for my success that I will preach about till I’m blue is the act of calorie tracking. It is necessary for most people who are looking to lose weight. I remember years ago when I was younger and my mom had me visiting a doctor at Sanford, they handed me this book that I was supposed to track everything in. Needless to say that book stayed empty, that was a lot of work that was just not fun in any way. However, in modern days this chore has become more of a hobby with phone apps and community driven databases of foods. The basics of a keto diet. When I started my recent and only successful goal to lose weight, I did it by jumping into a keto diet. What this means on the surface level is that your goal is to eat less than 25g of net carbs a day (which is less than one average banana). There is a lot of talk out there in diet communities about how the increased ketones in your body on this diet help you burn fat faster. I don’t know how true these claims are, and I don’t think anyone truly does. What I do know however is that when I was eating a diet higher in fat and protein, I was able to become full and satisfied with my food much more than I was when I was eating more carbs. Weight Loss: You can't outrun that fork. When it comes to health there are two pillars that hold you up. Your diet and your physical activity. Both are important to take into consideration and changes in either will make big changes to your overall well being. However, if your main goal is to lose weight you will want to pay much more attention to your diet than any sort of exercise routine. I believe this is especially true at the beginning of your journey.